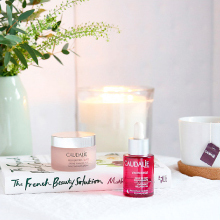 Caudalie – pronounced kô-da-lee – is a luxury French skincare brand combining revolutionary beauty techniques with proven historical secrets from their Bordeaux vineyards. Born on the vineyards of the Château Smith Haut Lafitte in Bordeaux, the Caudalie range encompasses delicate aromas and textures which glide onto the skin, whilst delivering exceptional results. By harnessing powerful anti-oxidants from the skins and seeds of grapes, the Caudalie range offers the best anti-ageing shield for skin whilst halting free radical damage, the main cause of cutaneous ageing. In 1996, Caudalie signed an agreement with the Pharmacy Faculty of Bordeaux to set up its own Research team – a team which is still in place today. The ongoing research adheres to the philosophy of the brand, joining the benefits of science and nature while maintaining the greatest respect for the skin and the environment. Caudalie Vinotherapists are extensively trained to deliver the ultimate in luxurious, indulgent treatment, which are globally recognised as a must-have experience, and the Devonshire Spa is delighted to be able to bring this experience to its award-winning facilities. Caudalie skincare treatments incomparably protect, repair, and revitalize the skin with formulas that contain a maximum of natural active ingredients and patented molecules of the vine, ensuring gentle care and optimum benefits. Committed to their own “cosm-ethics”, Caudalie products are free of parabens, phenoxyethanol, mineral oil, artificial colorings or sodium laureth sulfate. No ingredients of animal origin are used, products are not tested on animals and a maximum of natural active ingredients can be found in all products.